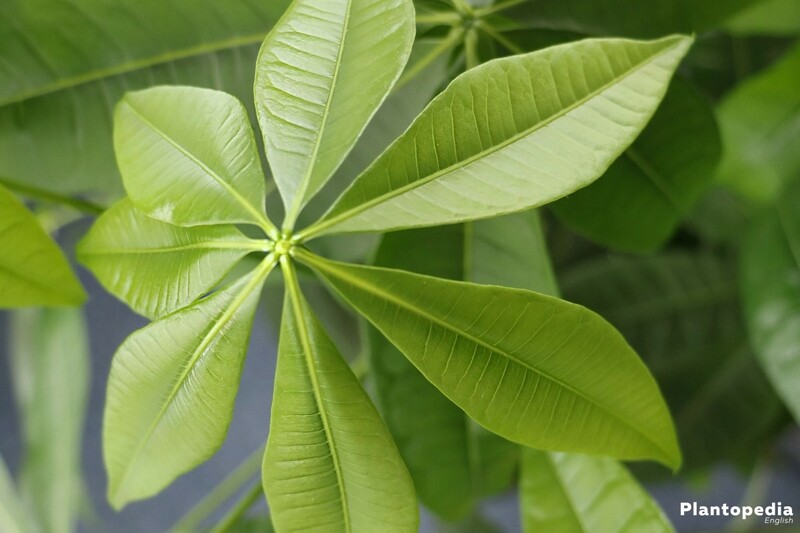 The money tree (Pachira aquatica), kapok tree plant from Central America, is well-known as cocaa tree in Germany. 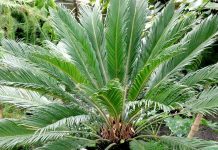 The striking feature of this decorative plant is the big, palmate leaves. The ornamental chestnut is a real indoor plant and arrayed properly it is a real gem. In the stores, it is offered predominantly with a braided stem but that is not unproblematic. The money tree, Pachira aquatica belongs to the mallow family. 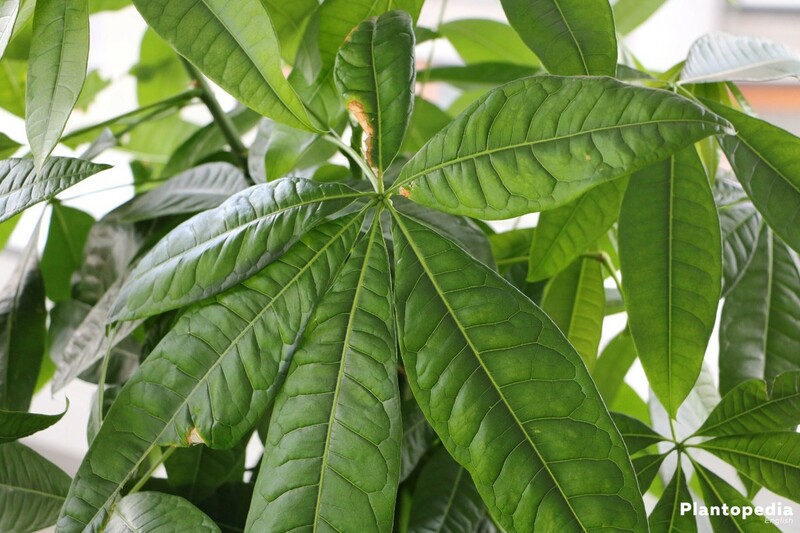 In Central America, their natural habitat, Pachira aquatica grows as an evergreen deciduous tree with a height up to 20 m. However, it does not reach this height as a pot culture by a long chalk. Here it does not normally grow higher than 150 cm. 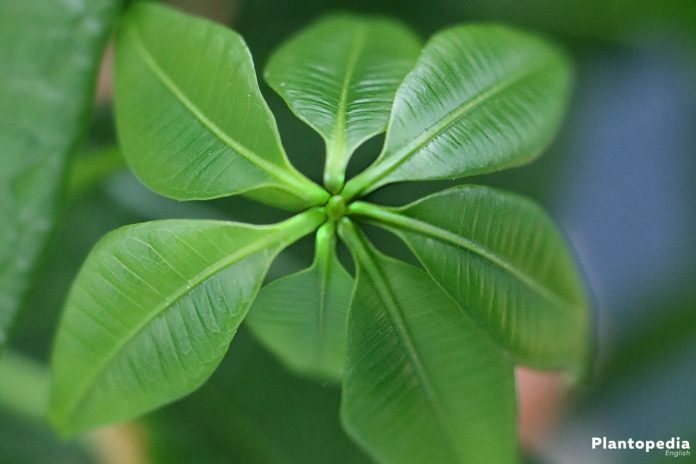 The name money tree comes from the Asian region where it promises luck and prosperity. 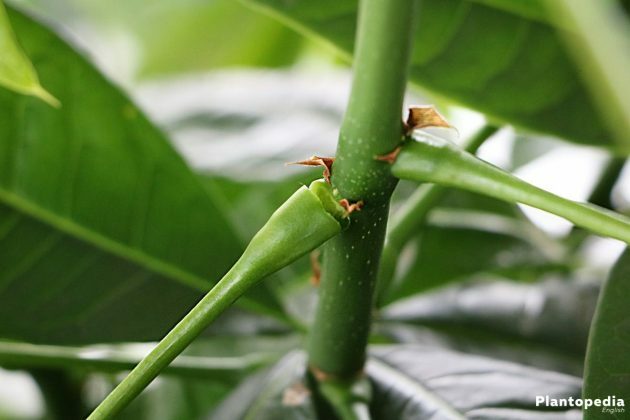 Buying a money tree, you should preferably decide on a specimen with a straight, unplaited stem, which develop significantly better. 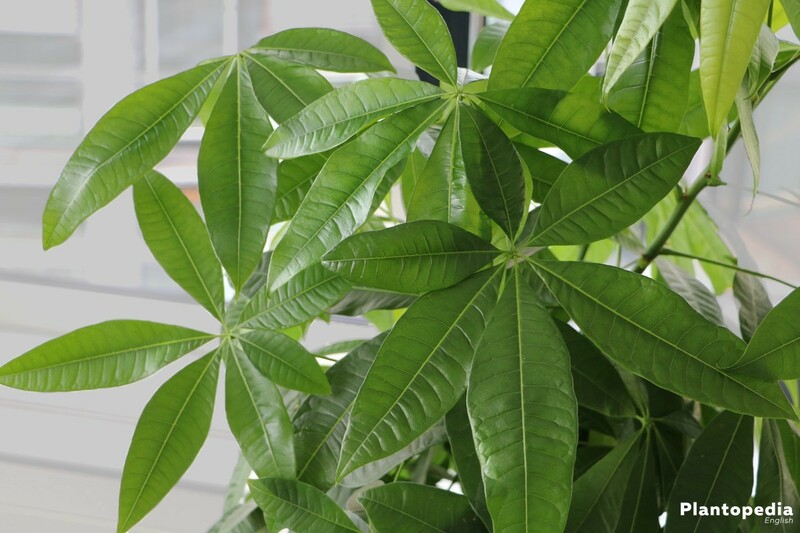 This attractive indoor plant, Pachira aquatica is a quiet modest plant, if it is going about care. In summer, it feels comfortable indoors as well as outdoors. If it is not overwatered, if it is in the right location and has enough space, it will be able to unfold its full splendour. 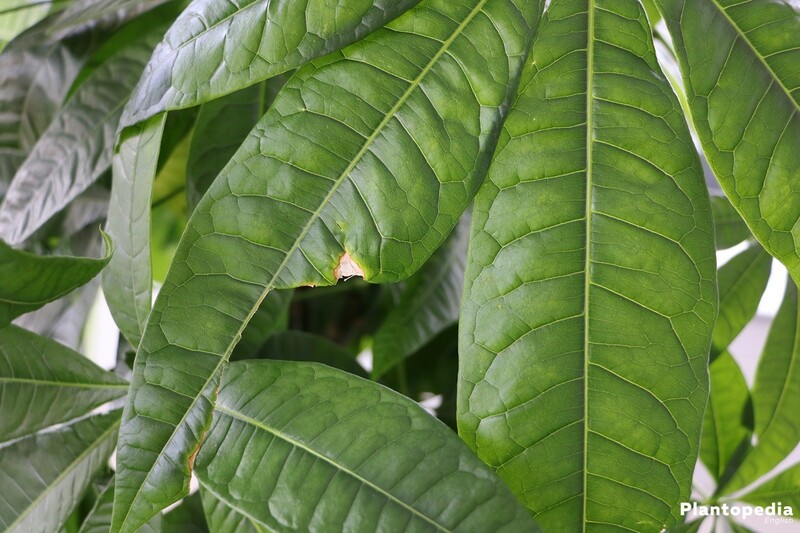 The location for this plant (Pachira aquatica) should be bright, whereby half-shade can be temporarily tolerated, as well. Partly it is also thankful for some sun, if it does not shine on the plant during the midday period. 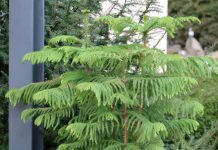 If the plant is outdoors, additionally a sheltered location has to be ensured. 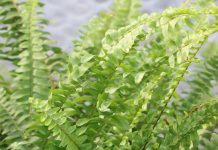 It is best to put it in a half-shade spot, thereby it is able to get used slowly to the new environmental conditions. Frequent relocations are to be avoided. The money tree could react to this by dropping leaves. 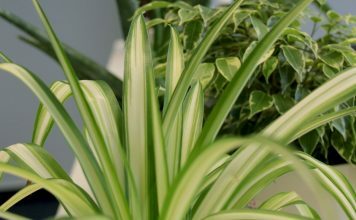 Room temperatures between 12 and 25 degrees feel also comfortable for the plant in the apartment. It does not like too cold or too hot temperatures. Growing towards the light, it should be rotated regularly in order to avoid an imbalanced growth. In order to be able to thrive well, the ornamental chestnut needs a loose, permeable and nutritious soil. 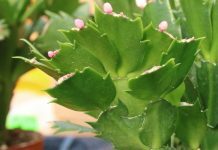 This can consist of common cactus or flower soil or of pot plant soil, which can be loosened by the addition of expanded clay, perlite or sand. Moreover, the plant can be kept in hydroculture, as well. At the latest when the pot is rooted well, you should repot the money tree (Pachira aquatica) in a slightly bigger plant vessel in fresh substrate. For this purpose, the best time is spring. The new pot should have adequate extraction holes available. An appropriate drainage of rough gravel makes sure that surplus water can drain. 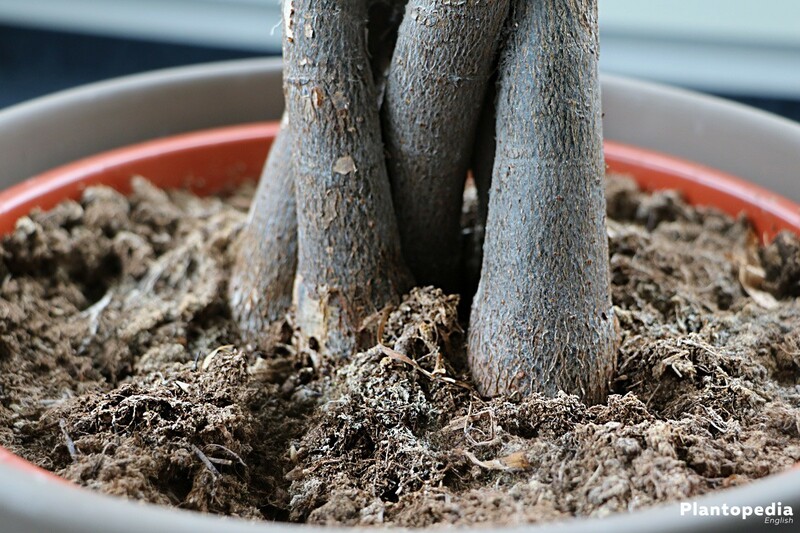 After being taken out of the old pot, all dead, dry and damaged root pieces of the plant should be removed. After the implantation, the soil should be pressed on and watered abundantly. However, repotting is not only recommendable if the pot has become too small. 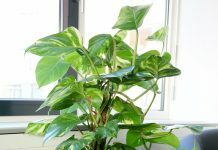 The repotting of this plant should be carried out for the first time straight after buying. The reason is mostly the too small pots, in which this plant just as many others is offered. Later it is enough to repot it about every three years. The ornamental chestnut pachira aquatica loves slightly wet to dry soils. Wet feet and a wet stem are not tolerated at all. The stem of this plant is thickened down to the bottom. In this thickened part, it is able to store water for longer dry periods. In order to meet the nutrition needs, you fertilize the money tree (Pachira aquatica) with green plant fertilizer from May to August/September about every 14 days. This should be given only half concentrated. Apart from that, particular fertilizer sticks are available to put them in the substrate. For the right dosing the manufacturer information is decisive. 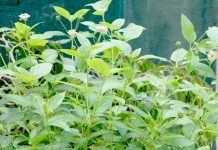 Fertilizer can be renounced for the year of buying or repotting. Too much fertilizer would harm the plant or make it shoot up without being able to develop a dense tree crown. Even if a cut of this decorative ornamental chestnut is not necessary, it can be cut easily if it has become too big or grown unevenly. Appropriate pruning can be carried out with ambient temperatures over 20 degrees. However, spring is the best time. The money tree (Pachira aquatica) can be trimmed to any height. 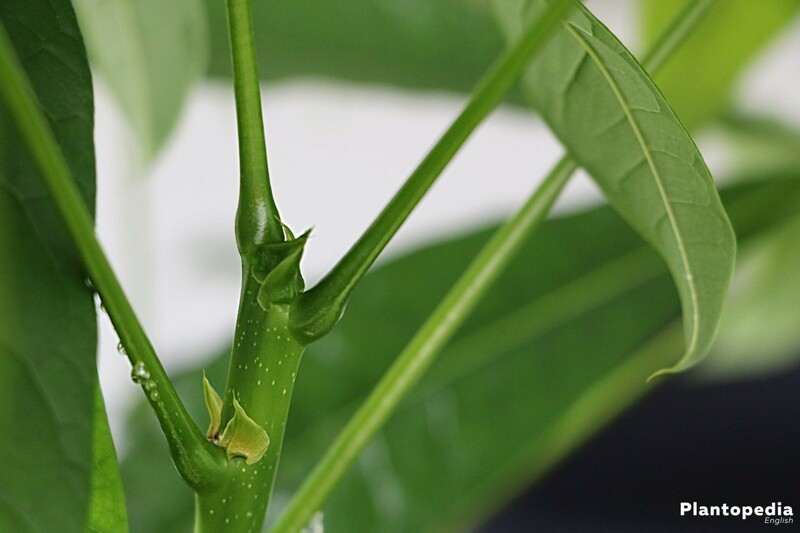 You shorten all the shoots and it is best to cut below a leaf axil. The plants sprout again after a short time. 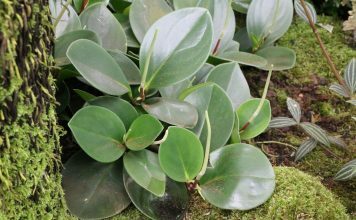 After cutting, it is usually, that the originally even shape of the plant gets lost. By the way, you can also grow this ornamental chestnut as a bonsai. The most common way of breeding the ornamental chestnut pachira aquatica is by the help of cuttings. 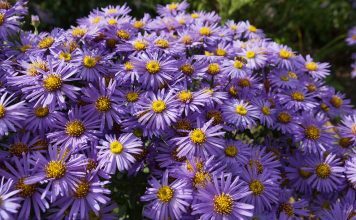 These can be taken from the mother plant in late spring or summer. 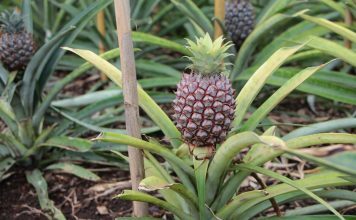 The breeding by seeds is a slightly longer process than the breeding by cuttings but less complicated as well. 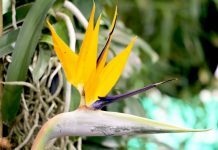 Besides the appropriate seeds, you require a breeding vessel and an earth-soil-mixture. 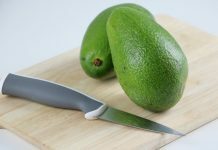 It can also be breeding soil mixed with sand or perlite such as common cactus soil or cocos-fibre, a plant-based culture substrate. Previously, you soak the seeds in lukewarm water for about 24 hours. Afterwards you fill the breeding vessel with the respective substrate. The seeds are spread evenly on the substrate and covered with soil of 1 cm. Subsequently, it will be watered evenly and the whole thing will be put in a bright location with temperatures of about 22 degrees. During the whole germination time, you keep the substrate evenly wet without being waterlogged. 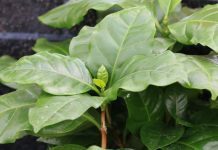 As soon as the seedlings are big and strong enough, they can be replanted in pots and accordingly cultivated further. If the ornamental chestnut spent the summer outdoors, it is time from about September to take it back indoors. In winter, it can be placed in slightly cooler place than the rest of the year, but the temperatures should never get lower than 15 degrees. However, temperatures below 10 degrees are tolerated for a short time. The wintery location should be bright without direct solar radiation. It is watered significantly less in the cold season and fertilizer can be foregone completely. Also in winter, the plan can be sprayed once in a while. Particularly important is the frequent pest management because dry and warm heating air can lead to pest infestation quickly in winter. 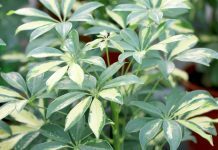 The yellowing of the leaves can occur through a low humidity, frequent relocations well as too much or too little fertilizer. 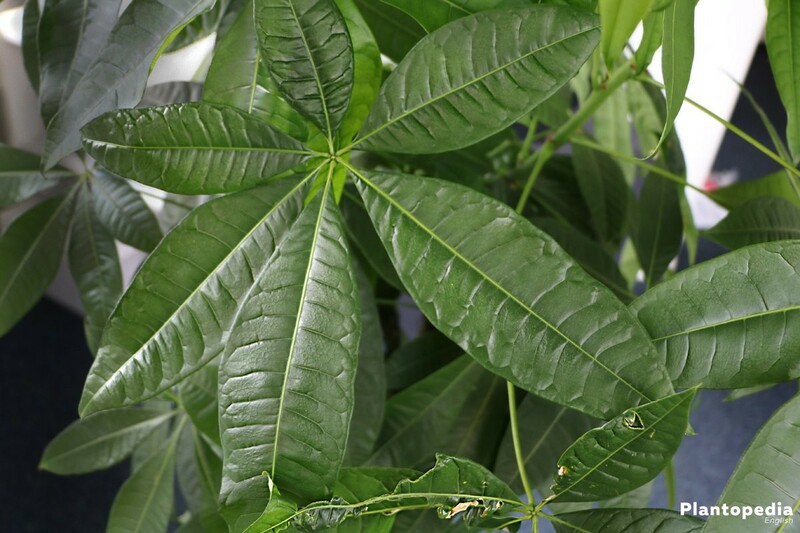 Depending on the reason, the humidity should be increased by frequent spraying and the plant (Pachira aquatica) should get a permanent location where it can be permanently. Eventually, you should adjust the addition of fertilizer and if necessary, replant in fresh substrate. Leaf spots can be an indicator for potassium deficiency. Special fertilizer that is given according to the manufacturer specifications can be a remedy. Root rot is the consequence of too much moisture and waterlogging and cause an increased leave drop and a soft stem. 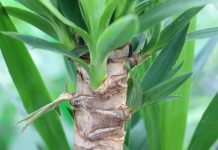 If you notice a disease in accordance with this, you should take the plant out of the pot immediately, liberate the root bale from soil and remove all rotten and dead pieces or roots. Subsequently the plant is repotted in the fresh substrate. If a greyish-white coat develops on the substrate, it is presumably mould. This is also an indicator for too much moisture. At best, you exchange the complete substrate. If the mould infection is only superficial, it is mostly enough to renew only the upper soil layer. Scale insects appear especially in the winter months and with simultaneous air and soil drought. They can be spotted due to the small brown humps as well as the sticky film, the excretions of the scale insects on the leaves. 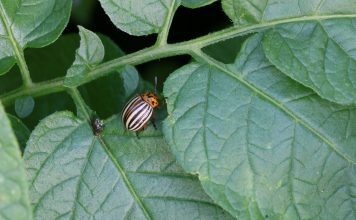 Fighting the pest is possible for example with repeated coating with a solution of soft soap, water and alcohol as well as the application of ichneumon flies or ladybird larva. Additionally, the humidity and watering manner should be adjusted. The risk of an apdhid infection arises in particular if the plant is outdoors in summer. An initial or light infestation can be mostly eliminated or at least reduced significantly by showering off. 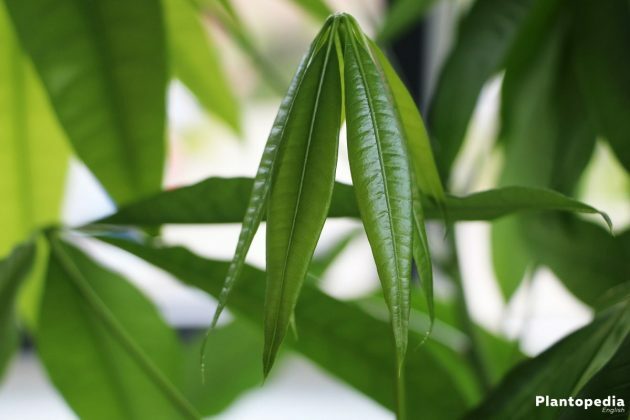 Otherwise you can also treat the affected plant with a lotion of water and neem oil. If this does not suffice, you can apply plant protection products if necessary as a last measure. Causally for a spider mite infestation is usually also a too low air humidity. It appears as a fine white web primarily in the leaf axils. By a thorough buzz off you can mostly reduce the infestation for the most part. Additionally, the use special predatory mites or appropriate, rapeseed oil-based preparations are provided. If small black flies buzz around in the pot, it is very likely going about fungus gnats that lay their eggs on the substrate. You can prevent that by covering the substrate with a thin layer of sand or fine gravel or by hanging yellow panels from the specialist shop. Most commonly the lucky tree is offered with a plaited stem. 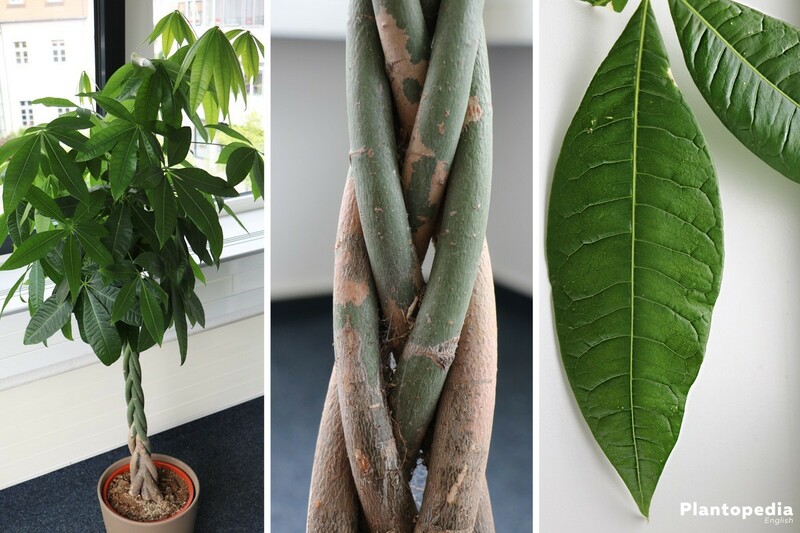 In this case it always consists of several plants in one pot, whose stem axis were plaited as one stem. 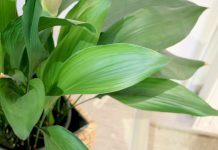 It also looks very decoratively, but it can become problematic for the plant. The bark of the stem is damaged by the narrow and tight plaiting, which makes the ornamental chestnut, in turn, more vulnerable for pests. In order to keep the plant healthy, it is recommendable to disentangle the stem carefully as soon as possible. The younger and smaller the plant is the easier you can carry it out. With older specimen, it becomes a lot more difficult and from a certain height, it is hardly feasible. At best, when buying the plant you decide upon a specimen without a plaited stem that can prevent several problems. The attractiveness of these plants is not inferior at all to the ones with a plaited stem.